Was awesome. We had a super fun and busy weekend celebrating. But really, I want to post this video from the night of his birthday. I think it's my new favorite video of the kids. It captures both of their personalities perfectly and just makes me happy. Patrick is in his underwear the whole video. Despite the last couple videos of Patrick on the site, I promise he really does wear clothes. But, we started potty training this last week so when he's not outside, he's in his underwear. Just makes things easier. Angie took the kids to the consignment store one day to get Madelyn some rain boots and this racecar bed happened to be there. * Patrick went bananas over it. He had to call me at work to tell me about it. Angie was texting me all day the things he kept saying about it. "If that bed comes to my house, then I'll just lay down and go right to sleep! And if anything falls out of the bed, I'll just get out and pick it up then go back in my bed and go back to sleep! It'll be awesome!" 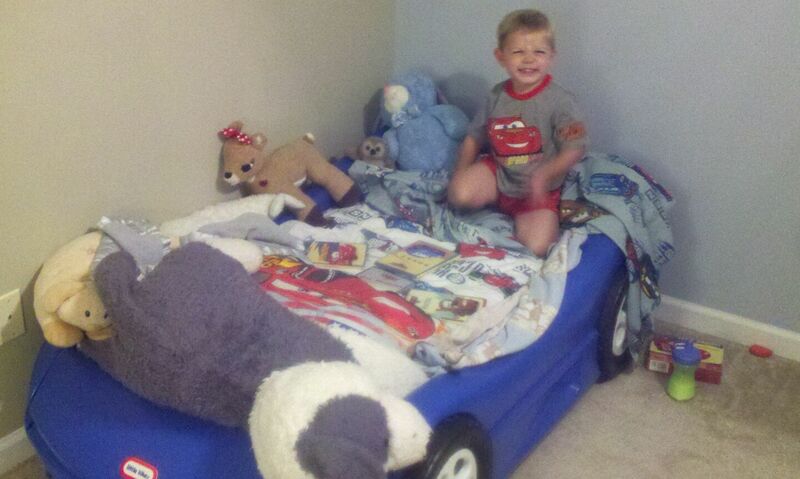 By the time I got home from work that day, he knew where he wanted every stuffed animal to go and exactly how he would lay in the bed and what he would look like sleeping in a racecar bed, etc. Every detail. Meticulously planned. So obviously, we had to get it for him. We had planned on transitioning to a big boy bed when he turned 3 anyway, so we were hoping his enthusiasm for his new bed would help the transition. I love that Patrick gets so excited he starts flipping his own presents off the bed. I also love that Madelyn is equally excited and just keeps imitating whatever sounds and squeals Patrick is making. Lastly, I know a lot of you check this site while you're at work. Just a heads up on the volume. A very excited 3 year old and his equally (if not more) excited 17 month old sister sound exactly like a whisper doesn't. *Funny story. The next day, when Aunt Abbie saw Patrick, she was trying to get him to tell the story about finding his new bed in the house. She asked him "Patrick, where did you see your new bed?" and he very excitedly answered "In the consignment store!" the video of him finding the bed is awesome!!! you guys did such a great job at making his birthday so special. thanks so much for sharing! That video is great!! Definitely one to show future girlfriends ;) Reminds me of another little boy screaming about an electric train! THis is so AWESOME!!! Patrick and Maddy continue to bring so many smiles to my face! I love them both! Thank you so much for sharing!